After living in renovations for the past few years, I’m beyond ready to finally get my house organized. I hate living in the chaos! 2014 will be my year to finally get my home organized and I cannot wait! I’m already starting the preparations. My Brother P Touch Label Maker was delivered yesterday and I’m making my list of things that need to be done. 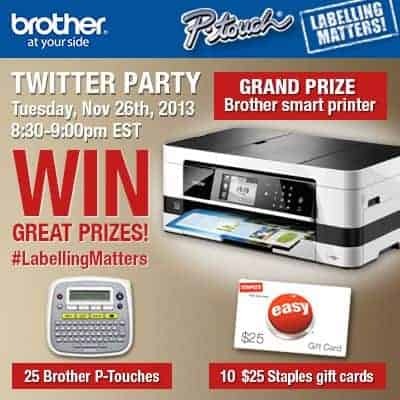 I’ll also be attending the Brother P-Touch #LabellingMatters Twitter Party on November 26th where I’ll be taking notes and learning ways to get organized. Hellen Buttigieg, Certified Professional Organizer, Life Coach and TV Personality, is one of the co-hosts and will be sharing lots of organization tips. Want to join me and get organized too? Of course, they’ll be fabulous prizes thanks to the sponsor, Brother Canada. Details are below! Visit She’s Connected to RSVP by adding your Twitter name and link to the linky. They also have a TWUBS set up for the party so it’s easier for you to follow along. Boy could I use this too! I def need to be more organized!